White-line woodblocks developed in Provincetown in the early 1900s. 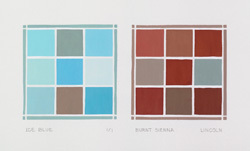 This century-old print technique combines with a contemporary grid format to show my specific sensibility for color. 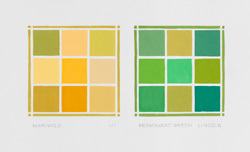 These abstract prints are studies on the subtle and disparate characteristics of color. The inexhaustible combinations of color have become a journey where the practice of color mixing continually leads to new discoveries. 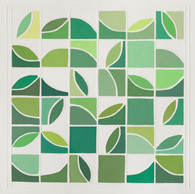 Grid: Green, 8 x 8 in. 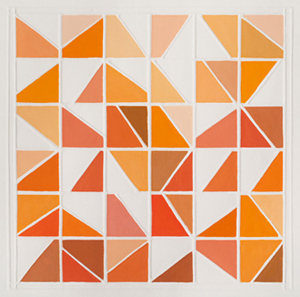 The series of prints titled Color Conversations consist of two grids of nine squares each. The print size has each square measuring 1 ¼". One square in the left grid is identical in color to one square in the right grid. This matching pair is separated and placed so as to have the same color appear different. 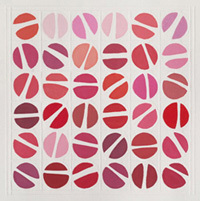 When looking at these prints some colors meld together, while others pop forward and back. They appear soft or intense, quiet or raucous. Viewed together what emerges is an awareness of the astonishingly limitless qualities of color. 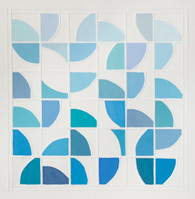 Innovators of the White Line Woodblock Print"
The Color Conversation "Jaune Brilliant, Ash Blue" is in the permanent collection of the Provincetown Art Association and Museum to commemorate their 100th year.